Save 59% with a bundle deal! 3D The best places to find quality free textures, plus a free starter pack. Review A nicely designed and engineered sit-stand desk topper. 3D Learn how to create procedural environments with Houdini 17's new and improved terrain toolset. 3D A step-by-step guide to creating a believable werewolf in real time. 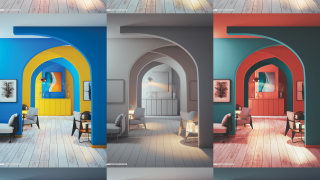 3D Follow these 4 pro tips to make your interiors shine. 3D Create convincing image blends with this 3D guide. VFX These apps, cameras and collaboration software are vital for VFX artists working on set and in the studio. 3D Sculpt a simple, anatomically correct human nose in ZBrush. 3D Industry experts share their Houdini tips and tricks to help you get to grips with the versatile 3D software. Tools The new features that make MD 8 such a strong update. 3D These artists have reached new levels of photorealism. VFX Discover how DNEG created giant pigeons, baby legs and more. Photoshop Give your work depth by adding colour distortion in Photoshop. Maya These top plugins will help you stay creative and increase your productivity. Review Do the new KeyShot 8 features justify its hefty price tag? 3D Discover how to improve your render experience with our expert advice. 3D Shake up your 3D process with these need-to-know shortcuts. 3D Get to grips with this physically accurate render engine. Concept Art Design vehicle concept art for a PlayStation 4 game. 3D Learn all you need to know about cameras and lenses in 3D software.